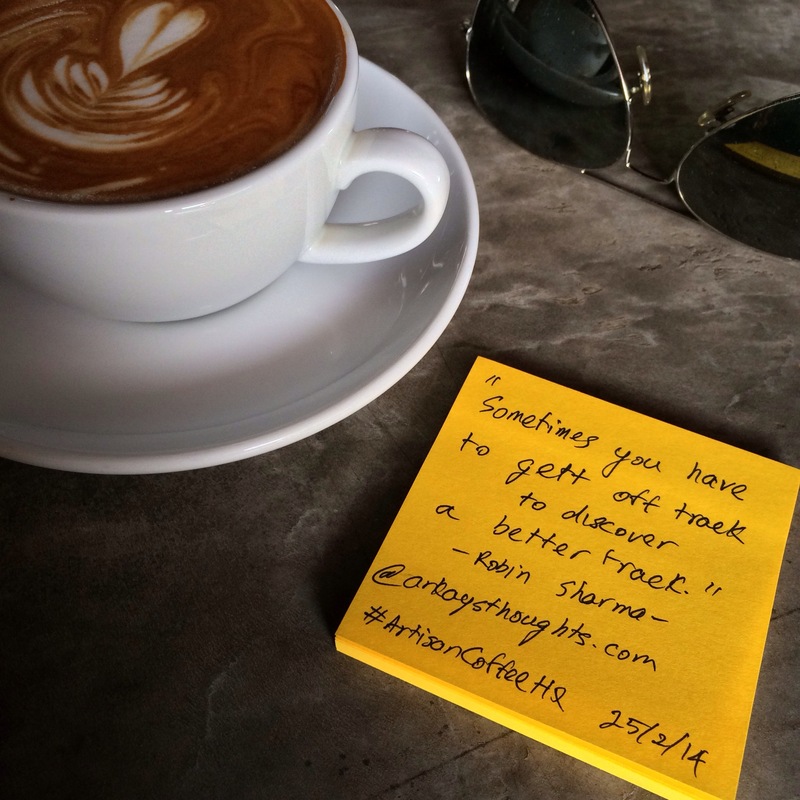 Just had my Artisan Coffee flat white while talking to Alan about coffee, practice, giving back and other general points of life; which got the brain turning a little and got me thinking about today’s QOTD, got me looking back at the detours over the last few years, when life went Off Track. How life isn’t always smooth sailing and that the ideal route isn’t the only route. I can definitely say, with much confidence, that leaving MUWCI (UWCMC) in 2010 and then having to take an Intermission from Monash Malaysia in 2012 counts as going off track. Were these detours off track (amongst others) truly leading me to discover a better track? At this present moment in life I’m going to say yes, although each time felt like a win for Fibro and pushed me to feeling like a failure, especially in 2012…. Anyway, with failure always comes the option to either give in or fight. And so I picked myself up each time, though not necessarily immediately, and Kept Moving Forward. This lead to learning, growing and maturing much along the way; in mind, body and soul (as corny as it sounds). Priorities changed and I discovered more about myself. This is nowhere near what the ‘me’ 7 years ago would’ve envisioned. So, is this the better track? Yes because I’m happy now because of who I am and not what i have. Yes because the person I was then was a whole lot more Materialistic, Egoistic, Judgemental and Superficial and only would’ve gotten worse if i never fell. Yes because the last few years have helped me develop and discover my passions, things that I might not have had time if things had gone the other way. In a nutshell, I’m happy with the person I have grown into today but know that I can improve and develop more, but at my own pace and by my own benchmarks. Previous Previous post: Arkay’s QOTD. “Off Track.” Robin Sharma.